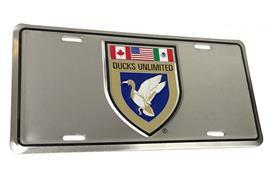 Get the Official DU Crest License Plate! Share your wetlands and waterfowl conservation message with others with this quality metal license plate embossed with a full-color Ducks Unlimited Crest logo centered on a silver background. This satin aluminum license plate is a perfect accent for your vehicle, a conversation piece, and a great gift.